Did you know you can share that lesson you're super proud of with fellow teachers? You can also collaborate on any Deck with your colleagues and friends in real time and even present it simultaneously! 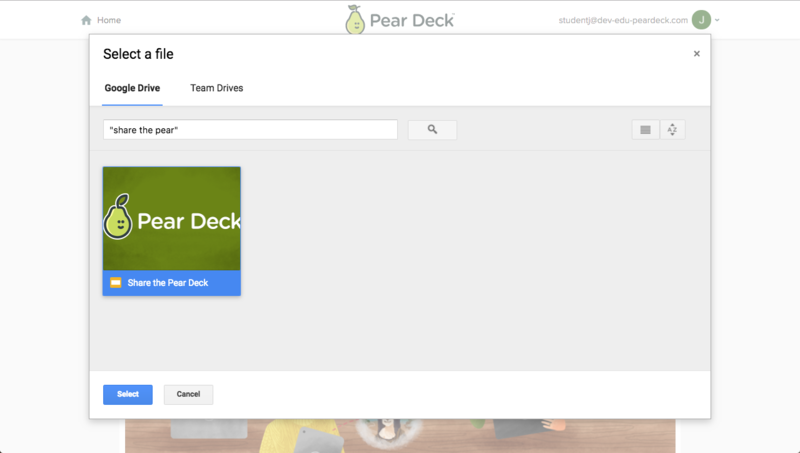 Pear Deck files live in your Google Drive. To share a Pear Deck, locate the file, select it, and click on the share button. 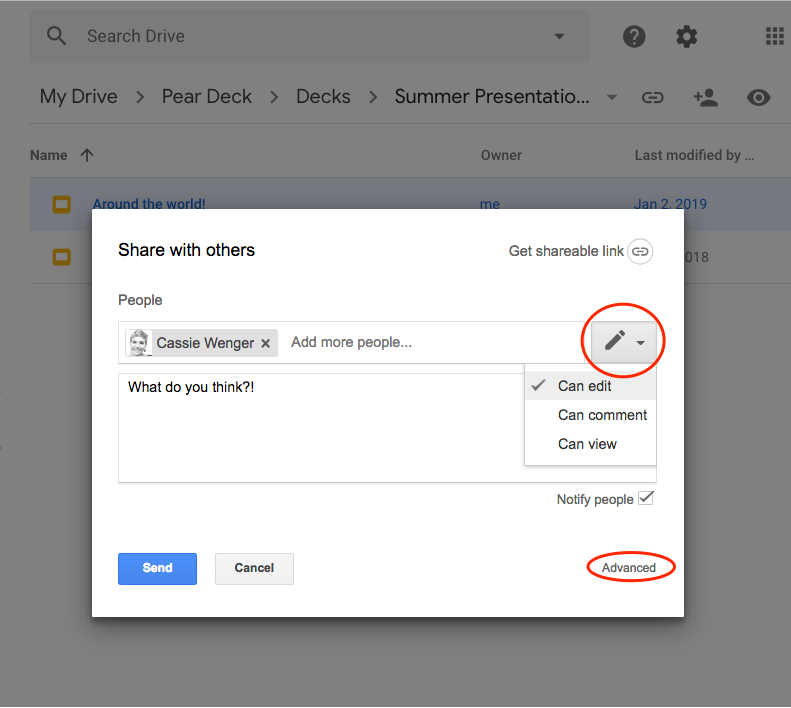 In the Share with others menu, add the Google email addresses of the people you want to share this file to. Make sure to adjust your sharing permissions. 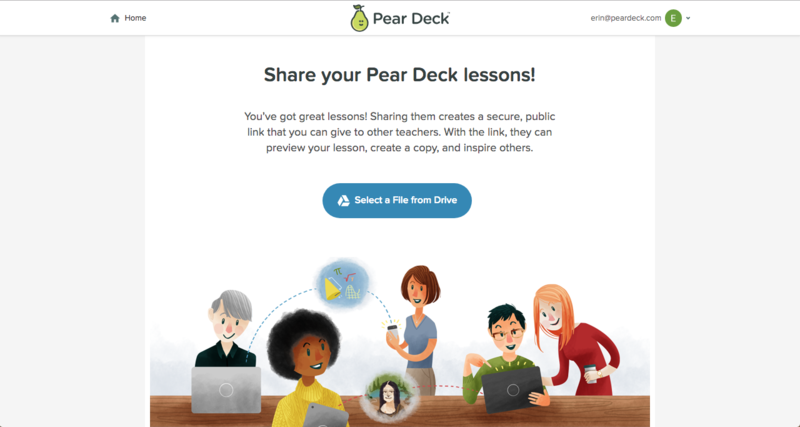 What are some good reasons to share a Pear Deck? You can share edit ( Can edit) permissions to another user for full, real-time collaboration. This is great for co-teaching or sharing with substitute teachers. Please note that any co-owners have the power to delete the file. You can allow your friends and colleagues to leave comments ( Can comment) so they can share their thoughts and questions on the file, but not edit it. If you share it with viewing permission only ( Can view), they will be able to view it only. While they cannot edit it, they can make their own personal copy of the file. Click on Get shareable link to generate a link that you can post to twitter, a blog post, or paste in an email to share a deck with colleagues. You could also share a read-only template with your students if you want them to build a Pear Deck for a class presentation. When you publish your Deck, it becomes public, so others can preview, copy, present, and share it. Published Decks can be shared through a link or on social media via Twitter, Facebook, and Pinterest. Public Decks will also show up in search engines when other teachers search for specific topics. When you publish a Deck, you get to create a custom page to tell others the subject(s), grade level(s), and any Common Core standards it meets. Get out there and start sharing your incredible lessons! 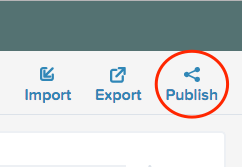 Go to the Sharing page to search for the file you want to publish. Open the file you want to publish in the Pear Deck for Google Slides Add-on or the Pear Deck Vocabulary editor and click the publish button (if you choose this option, skip down to Step 4). 2. On the Sharing page, click Select a File from Drive. 3. Search for the file you want to publish. Click on the file, then click Select. 4. 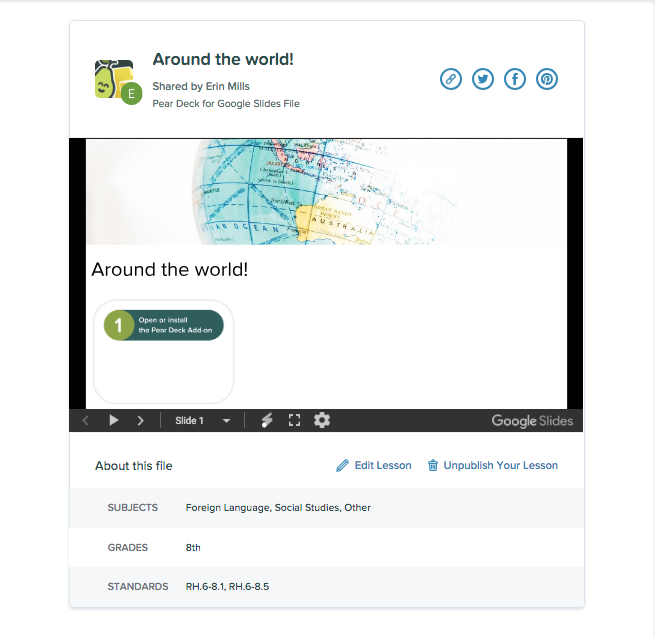 You'll land on the Publishing page, where you can describe your lesson with a title, subject(s), grade level(s), and any Common Core standards it meets. You can check the Credit me box to put your name on the lesson, or leave it unchecked if you prefer to publish the lesson anonymously. Before you can publish, you'll need to agree to Pear Deck's Terms of Service. You can share this Deck easily with a public link, Twitter, Facebook, or Pinterest by clicking on the corresponding icon in the top right corner of the screen. You can click the Edit Lesson link to go directly to Google Slides and update the Deck. The changes you make will be automatically updated to the public version, too. Click Unpublish Your Lesson to remove public access now. You will still be able to find the file in your Google Drive Pear Deck folder. Please note! You can only access this Preview page again by saving the URL. 7. If you decide at a later time to unpublish your lesson and remove public access to it, delete it from your Published Files folder in Google Drive. The public version of the Deck is automatically saved in the Pear Deck > _Published Files_ folder. Go to this folder, select the file, then click on the trash can that appears in the menu. It will only be deleted from published files. Your personal version of the Deck will still be in your Drive. All Decks are saved automatically in your Pear Deck folder, so unless it was moved deliberately, you can still find it there! 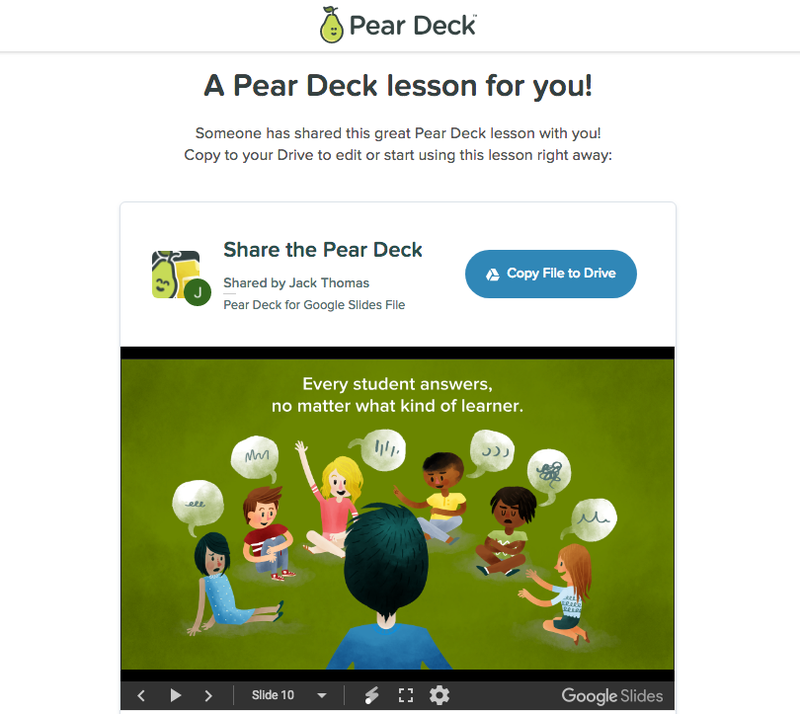 The Pear Deck Orchard is full of Decks created by Pear Deck Certified Coaches and other experienced educators. 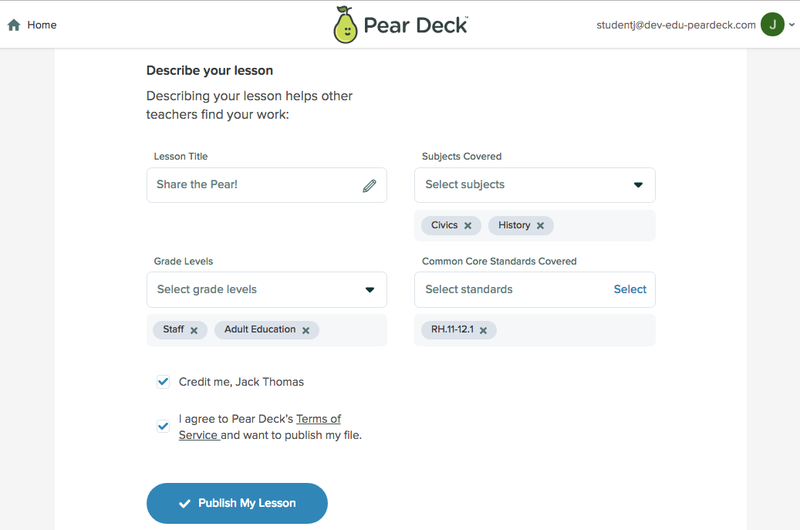 If you would like your Deck to be considered for the Orchard, please visit The Pear Deck Orchard page, scroll down, and fill out the form. Share your Deck with the world!